European Xbox jamboree this October where we fully expect to dirty hands on Xbox 360's launch line up. In May news emerged that Microsoft was to resurrect its 'Xbox jamboree' European event X0 this year. A couple of months on and the company has now confirmed a few details revealing that X05 will take place on October 4 and October 5. We don't know where it'll take place yet though, with the venue currently a closely guarded secret. Sega's new arcade board based on Xbox 360? Reports from Japan say Microsoft's next-generation home console provides the tech for the House of the Dead 4 machine. Recently, Sega staged a beta test in Tokyo for House of the Dead 4, the forthcoming light-gun shooter that uses the company's new "Lindbergh" arcade board. At the time, rumors began to circulate that the new board--which displays games in a 16:9 widescreen format--was based on the Xbox 360. 500 MHz of pure love.. The r500 chip is running at 500 MHz speeds- this helps Developers meeting a october/november luanch. Microsoft says this is the final clock speed of the chip, but there are reports that the chip can go higher- if this is true expect the Developers of the 360 to have the ablilty to do some serious overclocking. Playstation 3's RSX GPU eveloped by Nvidia is said to run at speeds of 550 MHz. Its skeptical for people to say "hey, the number is bigger- so its better." this isnt always true. The xbox 360's archtechture is "unified" unlike the PS3's design. The 360 might very well be the power house of the next generation. 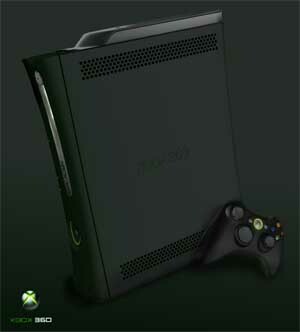 It gives you an idea how the Xbox360 would look like with a metallic black color. At this moment it's unknown if the Xbox 360 will be available in other colors besides the original silver look, but it's likely Microsoft will release Special Editions of the console later on with different colors like they did with the current generation Xbox. ATI WON'T BE making R500 chips for Microsoft's Xbox 360. ATI's job was to design those chips and to give the designs back to Microsoft to get them produced. ATI would have had to help Microsoft with tape outs and with design tweaking, as those guys at ATI designed the R500 Xbox 360 GPU. But developers are now getting the "Real" hardware still based on G5 MACs but this time with real R500 graphic cards inside. This means that R500 chip is taped out and that it is working but we don’t know whether this is the final chip that Microsoft plans to ship at later date. Microsoft plans to ship hundreds of thousands if not even millions of Xbox 360 consoles world wide from October, so it has to have at least that many R500 chips to power those consoles. We heard few times that Microsoft will get both R500 and CPUs from IBM’s Fishkill factory in New York. We cannot confirm this at this date but it sounds very likely to us. It’s interesting to note that ATI might work with the people who were not so successful in bringing Nvidia’s NV30 chip, as this chip was made at IBM’s Fishkill Fab. We should not blame IBM’s factory as it was Nvidia’s fault mostly - but still we find Microsoft's choice of Fab quite interesting. We think the Vole knows what its doing as it really wants half of the console market. It has a nasty competitor called Sony and its Playstation 3 as you probably know by now. We already wrote that Nvidia and Sony will get RSX GPUs from Sony's Nagasaki Fab2 facility as well as at OTSS.